The Clark's catalog identifies this man as the Thomas Dekker. * Not that cute kid on all those 90s TV shows, but the early modern dramatist. I'm going to go out on a limb here and say this is definitely not Thomas Dekker. For one, this man seems to be clothed in ermine, possibly some kind of parliamentary robe. Second, he's standing in front of a lavish manor house -- not an uncommon thing for the owner of such an estate to have painted behind his shoulder, but surely an odd choice for a probably low-born playwright. I'm guessing if we identified the house or the plant behind him (any thoughts? ), we'd have a shot at identifying the man. 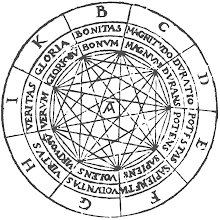 Barring that, or a deeper investigation into provenance (maybe there's another Thomas Dekker? 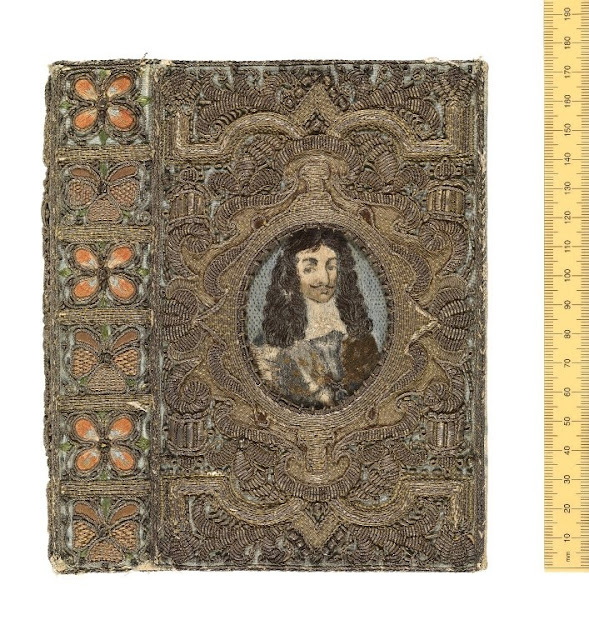 ), the best we can do is say that this embroidered portrait seems to depict a late-seventeenth-century member of the nobility who wanted to be remembered for his lavish home, long locks and (the laurels indicate) his poetry. So: what's up with embroidered portraits? To answer that, I have to tell you a story. A few summers ago, driving back from the Northeast, I decided to take a detour off I-95 to visit Agecroft Hall. For those who don't know -- which in my experience is, surprisingly, just about every scholar I mention it to -- Agecroft Hall is a Tudor manor house located outside Richmond, Virginia. Not a replica of a Tudor manor house, an actual Tudor manor house. It was bought at auction for $19,000 in 1925 by an Anglophile tobacco heir, Mr. Thomas C. Wiilliams, who then had the decrepit structure disassembled beam by beam, crated across the Atlantic, and reassembled outside Richmond, where it was to be the storied centerpiece of a planned housing development that Mr. Williams wanted to build on his family's farm. Think neo-feudal suburban chic for the upwardly mobile. Sadly, Mr. Williams died before he could fully enjoy his (new?) home, and the estate stands now as a museum, complete with a Tudor knot garden and a variety of period furniture, including a lovely painted bed and a tapestry from Mortlake. If you're interested, Bob Vila can tell you all about it. 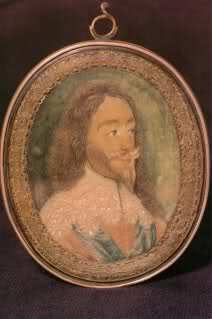 This image of Charles will be familiar to friends of the seventeenth century. Reproduced from a 1632 royal family portrait by van Dyck, it was widely disseminated in print through Wenceslas Hollar's engraving, which became the frontispiece for the Reliquiae Sacrae Carolinae after the King's execution. 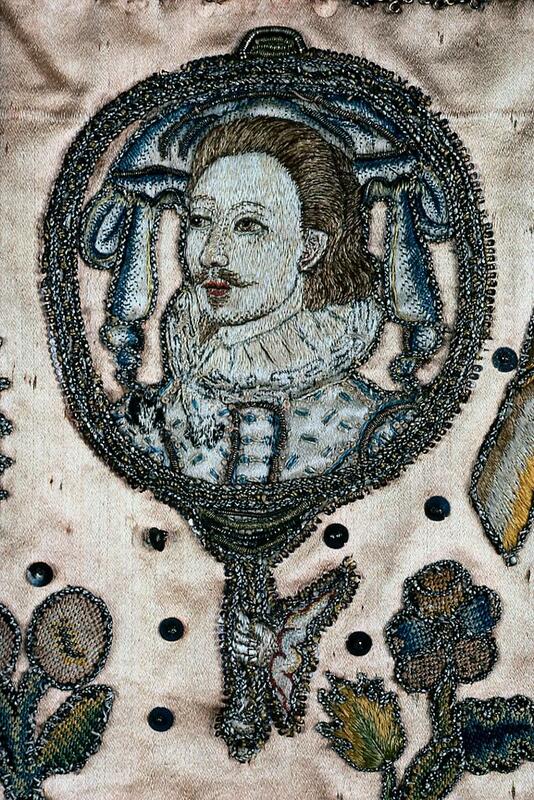 Rebecca Hackett has a great discussion of these two embroidered portraits and their relationship to the cult of the Martyr King. Circulated as miniatures to be hung in cabinets or on walls, these portraits served as displays of loyalty among exiled royalists -- signs of one's allegiance to the unjustly executed monarch. Of course, a print could (and did) just as easily serve that purpose. 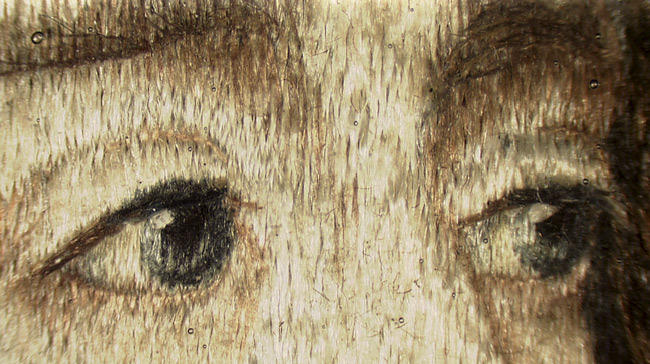 So why do we find so many embroidered portraits of the King? Her face and hands are bits of painted vellum -- skin for skin. So common are portraits on embroidered bookbindings that Cyril Davenport counts them as one of the three main categories of needlework bindings in his classic study of the subject. Here's a post-Restoration example (also from the Bodleian) of a Bible covered with an embroidered portrait of Charles II. Catherine of Braganza is depicted on the back. 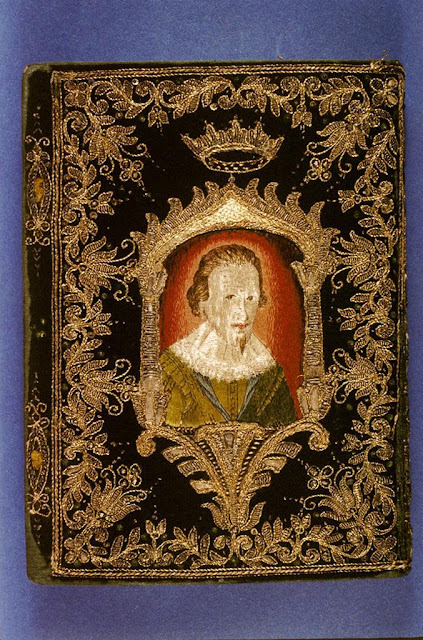 Of course, once a portrait was worked on a book cover, it might easily be cut out and reused on valances or cushions -- or images from other textiles might be remade into book covers. This charming portrait from a seventeenth-century cushion is framed in a mirror, as if the cushion's owner is staring at a reflection of himself. 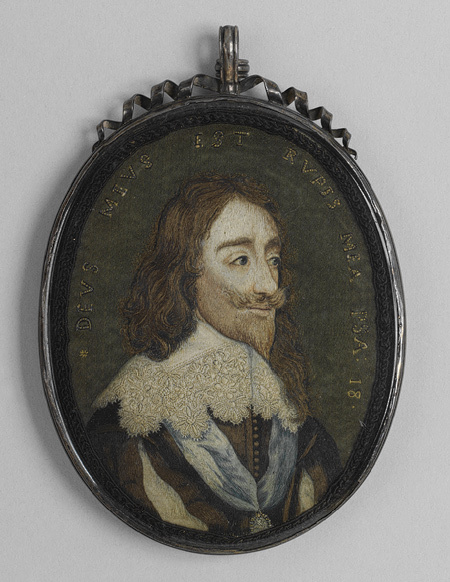 Though hardly as delicate as the Charles I portrait now at Agecroft, you can see how the medium lends itself to a certain tactility not available in print. I would love to see this in person; no doubt the spangles glimmer in the the light. Yet, even though embroidery offered what print lacks, both forms were crucially linked in the early modern period. The thing we call "print culture," especially the availability of high-quality engravings, made these kinds of embroidery possible for a wider audience of amateur needleworkers, just as the demands of needleworkers critically shaped what "print culture" was -- the kinds of images that were printed, how and where they were sold -- in the latter half of the seventeenth-century. In fact, I've come to think that, in a very real sense, we can't understand book use in early modern England without knowing a little something about needlework, too. After all, books are sewn objects. Definitely the work of an amateur. But, there you are: needlework portraits, reproduced from prints. How did I get (back) here? Like a Tudor manor house absurdly dropped into the middle of Virginia, my past refuses to quietly fall into disrepair; it insists on being rebuilt one beam at a time, same same but different. I cringe a bit, sharing this with you. Especially that interview. But -- maybe -- this act of sharing will lead to a purge. Maybe after this, personal history will disappear, and my brain cells will be free to study whatever they want! Quantam mechanics! City planning! The ancient Egyptians! The world will be wide open! ..... more likely, I'll just keep trying to make embroidery relevant to everything else I study. Whether pulped for paper or burned for firewood, the panels of Agecroft Hall can never not be the wood of a Tudor manor house. * I've only seen the short online entry. Its likely some catalog card or curator at the Clark could shed more light on why this was once identified as Dekker, and who it might actually be. ** If you find any the posts in this series useful to your own research, that's awesome. Please get in touch. I simply ask that you cite the post in anything you publish on that topic. Although I'm mostly posting images of cool things I've found, it's still the case that what you're reading is not the result of 5 minutes of wikipedia-ing but is based on many, many hours (days, weeks, months) of reading, studying, emailing and poking around libraries and special collections. Thank you for your kind words about your tour at Agecroft Hall. Please come back again! This creativity impresses me a lot and i just love this update. Hello, your needlework of Thomas Dekker is probably, I think actually King Louis XIV of France. See the 1648 painting by Henri Testalin . The Sun King as he was known is often depicted with the Laurel Wreath, sign of The Holy Emperor. I hope that this helps.